Today is the fourth anniversary of the Yarnell Hill wildfire tragedy. I want to review a bit of the meteorology here and also consider special products issued by NWS Flagstaff. Above is the 03:00 pm MST regional radar product from NCAR, the radar depicts a well-organized line of thunderstorms from east to north of the wildfire (which is producing the blue, smoke echo southeast of the line. The mesoscale outflow from this line of storms moved across the wildfire from about 04:18 to 04:30 pm causing a dramatic change in the fire's behavior, as would be expected. 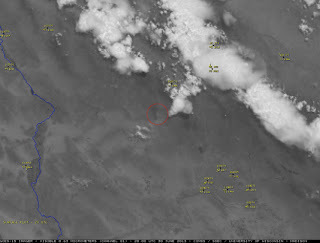 Visible satellite images that show the storms and the fire location at 01:00 pm (top) and 03:30 pm bottom (red circle indicates fire location). By the time of the image below clouds from the thunderstorms had spread over the fire location - photos in the Accident Investigation clearly show the dark clouds associated with the storms - second below. The NWS Flagstaff office handled weather support for this fire, which was at the southern edge of its County Warning Area (CWA). The spot forecasts were general, large-scale forecasts, similar to, but more fire-weather oriented, the general public forecasts issued by the NWS. 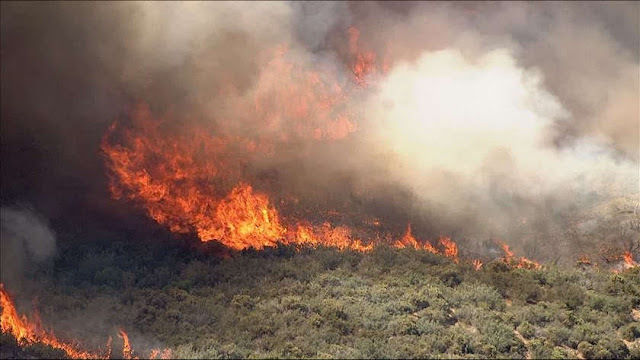 However, when the line of thunderstorms developed, the Flagstaff Office issued two very specific warnings about the mesoscale outflow that was likely to impact directly the wildfire. At 1402, FBAN receives a call with a weather update from the NWS office in Flagstaff. The NWS informs him of thunderstorms east of the fire that may produce wind gusts of 35 to 45 mph out of the northeast. FBAN relays the update to OPS1 and OPS2 via radio on state tactical frequency 1 (Tac 1). second update to OPS1 and OPS2 on Tac 1. These two "warnings" phoned directly to the FBAN indicate that the outflow from the storms was likely to produce significant wind shifts and speed increases, which would dramatically impact the fire's behavior. The "Red Flag" statement above seems, to me, to be a red herring, intended to deflect attention from the fire managers' actions after receiving the warning. After several readings of the report, I can find no evidence that the onsite, fire managers changed their strategy to react better to the approaching outflow boundary. Possibly, a let's wait and see what happens was the approach used. Which is very sad, given the very accurate warnings issued by the Flagstaff NWS Office. June has been hot and hotter and as dry as a month can be. I measured 0.00" precipitation here for the month. This makes the six month precipitation total at house only 2.24" - however, five years since 1999 have been drier here, with 2002 having only 0.49" through the end of June. Last couple of mornings have been much cooler and quite pleasant - even though our long run (16) of days at 105 F and higher continues. Low here at house today was 63 F versus 70 or 71 F at the airport. The first week in July continues, with a hostile large-scale pattern, as the 500 mb anticyclone that is off of northern Baja strengthens some and shifts northeastward over the Great Basin. The GEFS average heights at 500 mb (above - from 00 UTC last evening) is valid at 00 UTC on July 7th. 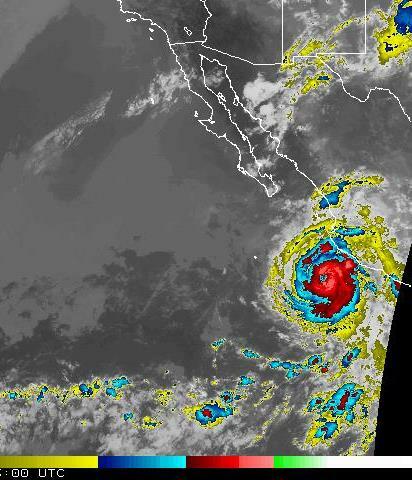 Can't see much in the forecasts to cause excitement, and hard to say when we'll eventually have significant intrusion of mT air move northward into southern Arizona. Compared to last year (when the last week of June brought almost 2.50" of rain), we'll be off to a very slow start to the summer thunderstorm season. Two large wildfires are burning in Arizona today. Skies at sunrise here were partly covered by high, thin veils of smoke, most noticeable to the west. There was also haze at low levels as per view above. Down at bottom is photo taken just before sunrise. 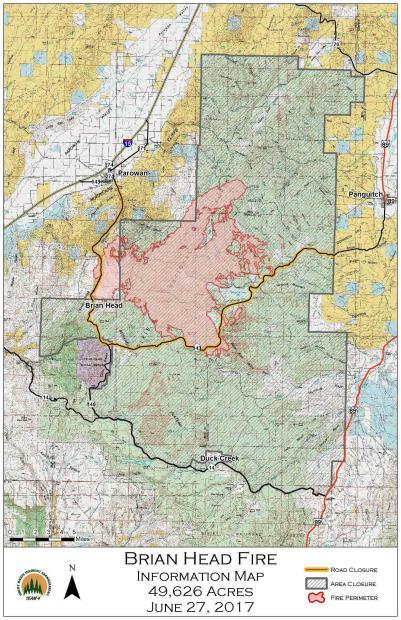 The Goodwin fire east of Prescott - map as of yesterday above - has caused hundreds of evacuations and closed one of the main highways into Prescott. The fire has burned over 20,000 acres. 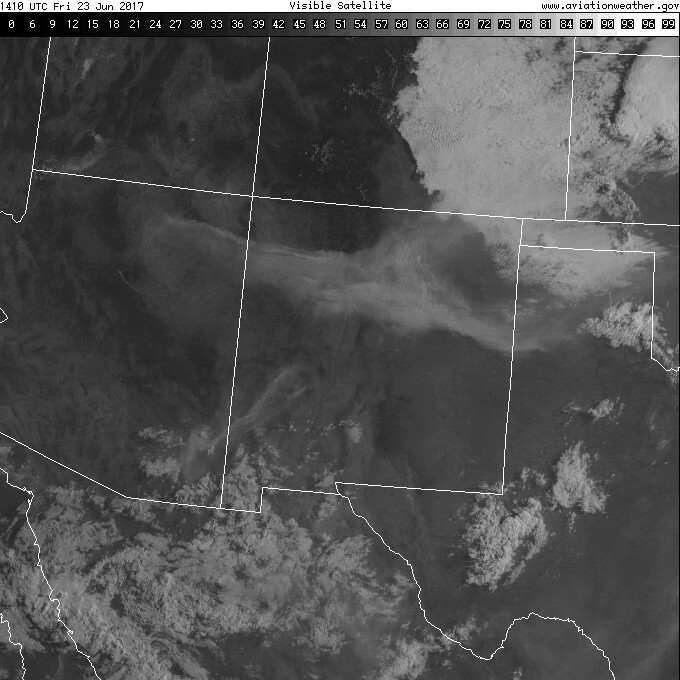 The 06:00 am satellite image below shows the smoke from this fire about at center of state. 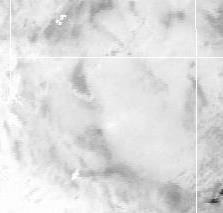 The Four Corners area appears to be covered by thicker smoke, but some of this may be clouds also. The Frye fire continues to burn on Mt. 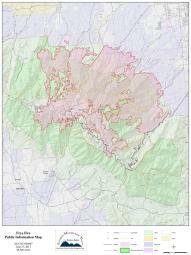 Graham and has now covered over 40,000 acres - map of burn area as of yesterday afternoon above. 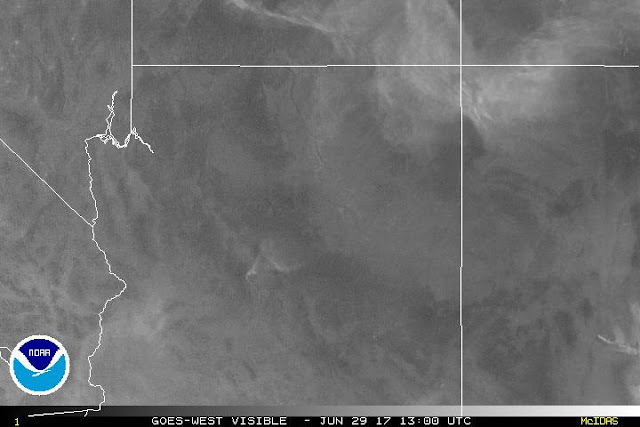 Smoke from this fire is at right side of the 06:00 am visible satellite image below. 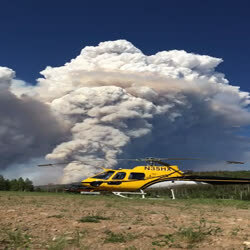 The Brian Head fire in Utah is the largest wildfire burning in the country - photo above shows smoke plume yesterday. 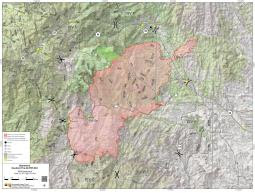 Map below shows burn area in red - fire is now over 50,000 acres. 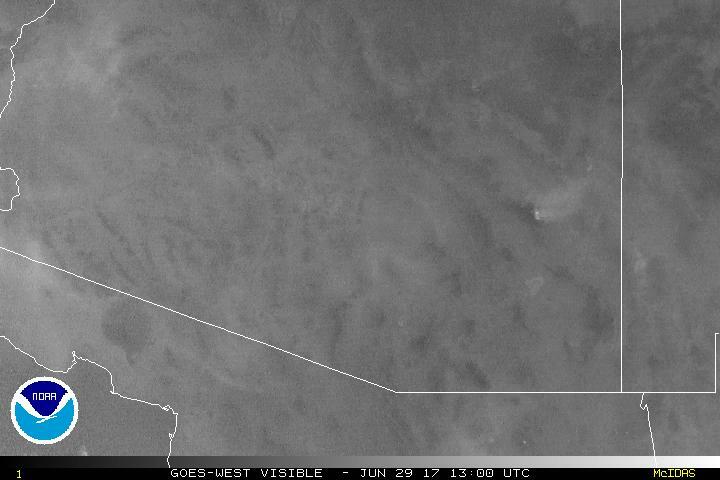 Radar image from southwest Utah below shows the smoke echoes from the fire just northeast of the radar. The Goodwin fire (above) is burning south of Prescott, Arizona, and is expanding rapidly today, current size of burn not known exactly. Satellite image below shows the smoke plume at 01:30 pm MST this afternoon (north-central part of image). Radar image of the Goodwin smoke plume from Flagstaff radar (above) at 01:20 pm. The channel two image with bright white fire enhancement (below) shows the active portions of both fires at 02:30 pm today. Fire weather situation remains critical over much of the Southwest. 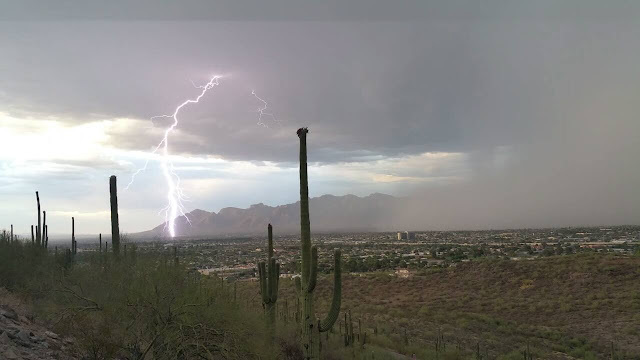 Last year on the evening of the 26th of June a very severe, wet microburst hit a region of north-central Tucson. 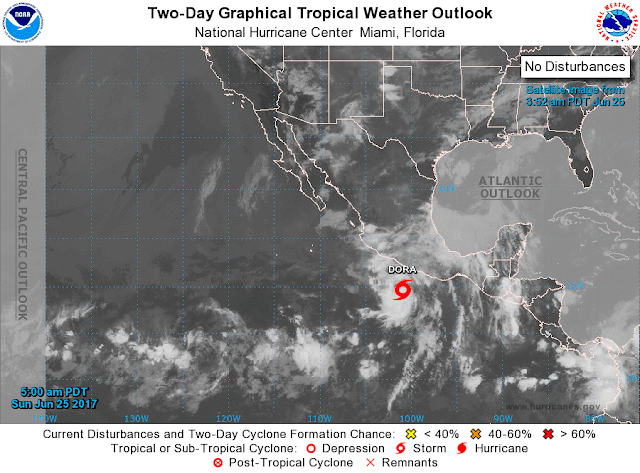 The summer storm season started early last year, with storms over the northern Sirra Madre of Mexico producing a series of outflows that slowly moistened lower-levels over southeastern Arizona. Severe thunderstorms occurred here at the house on both the 25th and 26. The microburst storm produced winds I estimated at over 70 mph a few minutes after 07:00 pm MST, along with an amazing 1.45 inches of rain. There are numerous posts on the blog about this event through the first week of July. Just showing a few graphics from that storm. Radar tilt 1 reflectivity a couple of minutes after 07:00 pm (purple tones are 60 to 70 dBZ). Photo looking north from A Mountain at about the same time - the northern portion of the microburst and outflow foot are at the right side. Map showing the portion of town where the microburst produced damage. 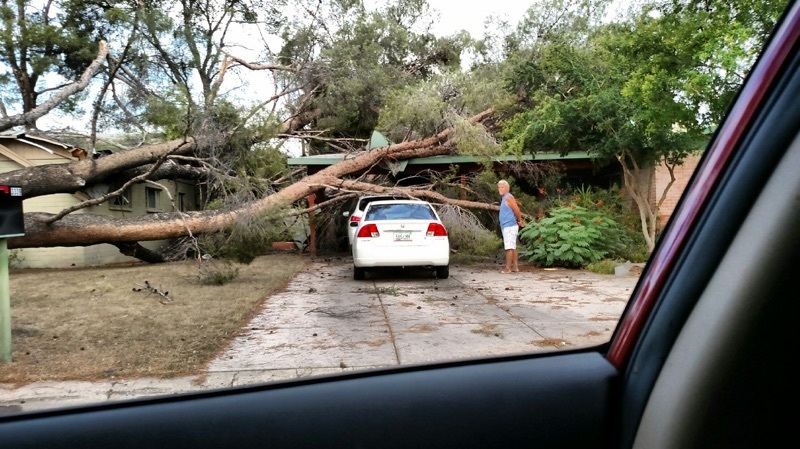 Big trees down in Winterhaven a couple of blocks to our south. Yesterday thunderstorm activity occurred a bit further west than the WRF-GFS forecast indicated - but no CAPE at low elevations as per the model's forecasts. Graphic above (weather.graphics and Vaisala) shows CG flash density for 24-hours ending at 06:00 am MST this morning. Storms surrounded the metro area, but the real action was far off to the east over New Mexico and Texas Panhandle, where there were many severe storms. Dora has become a Category 1 hurricane this morning and is located south of Cabo Corrientes (IR image above from 06:00 am also). The morning track forecast from NHC is shown below. 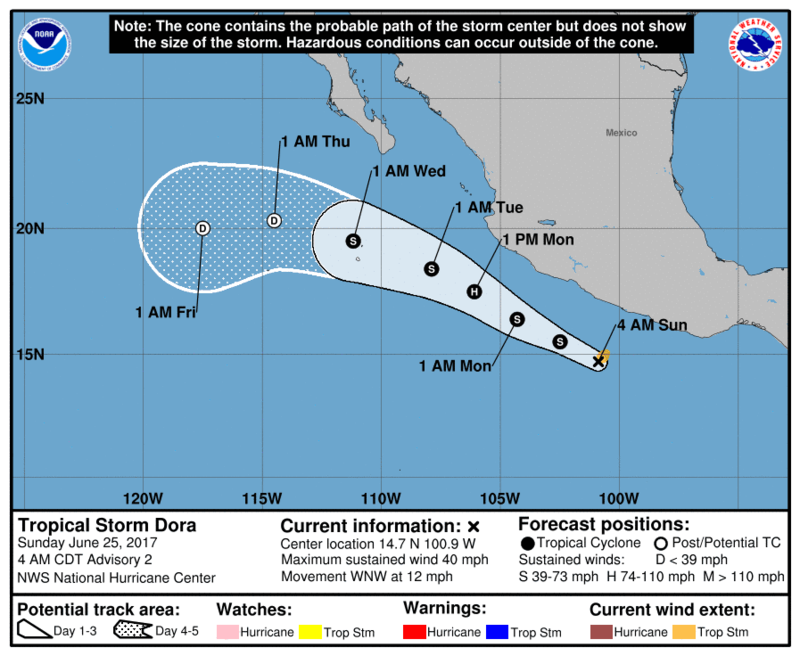 As the 500 mb anticyclone migrates westward across northwestern Mexico, it forces Dora to turn westward, and her chances of significantly affecting southern Arizona are rapidly diminishing. This morning's skewT plot of TWC upper-air data (above) continues to keep PW over an inch - but there is little CAPE and drying will begin later today - so much diminished storm activity today off to our east. Below is 500 mb forecast from the 06 UTC WRF-GFS run at Atmo - valid at 08:00 pm tomorrow. The 500 mb anticyclone is forecast to be centered west of northern Baja, with hot dry flow into the Southwest from the Pacific. A really nasty pattern that will mostly continue our long run of 100+ F days. 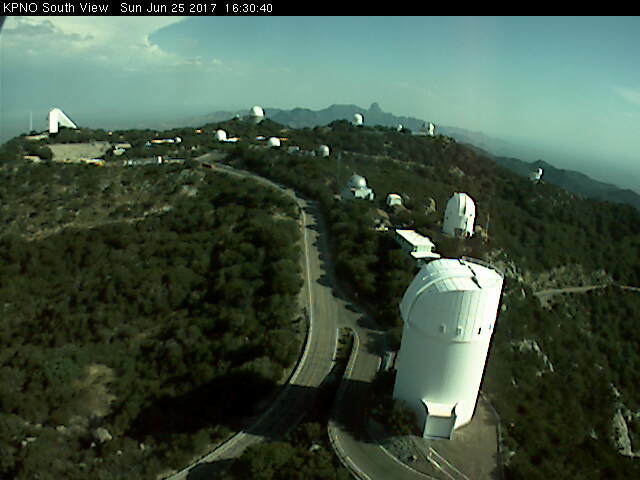 Radar above is composite for about 02:30 pm MST, while Kitt Peak view to the south below is from about 04:30 pm. High-based Cb just visible far to the south. Yesterday's WRF-GFS forecast of significant thunderstorms over southwest New Mexico proved quite good - above is El Paso composite radar at about 07:00 pm MST yesterday evening. These storms produced quite a few severe reports. The plot of detected CG flashes below (from Atmo and Vaisala) shows that thunderstorms impacted parts of Cochise County, but generally remained well away from Tucson Metro. The forecasted increase in moisture from the east also verified, with a shift of winds to the east and Td jump at the airport a bit after 10:00 pm last night. The moisture increase, as well as abundant debris clouds, kept the temperatures hot through the night - temperature here at house at 06:00 am this morning was 90 F.
The morning TWC sounding plot (above) indicates several substantial problems that need to moderate during the day, if thunderstorms are to occur in the local area. The wind profile is very weak and chopped up below 500 mb. The near surface moist layer extends up to only 850 mb, with a very hostile residual BL above to 500 mb. Little chance for surface parcels to break through that, unless deeper moisture moves in from the east. The 06 UTC run of the WRF-GFS keeps storm activity off to the east and south today, and its forecasted soundings at TWC remain unfavorable. Below is the model's forecast of precipitation through midnight tonight. 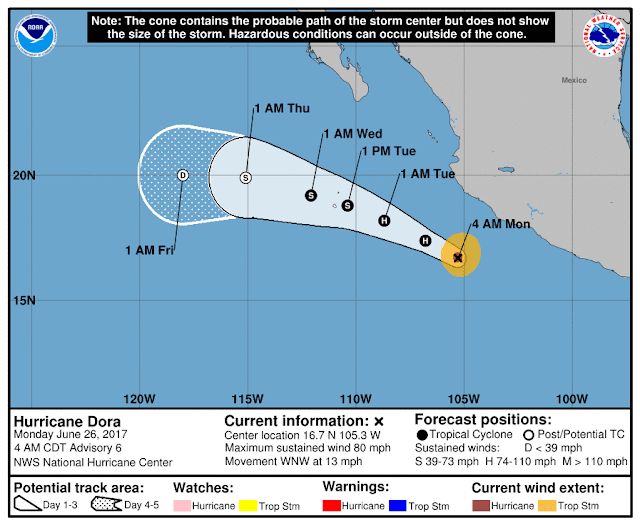 And far off to our south, TS Dora has formed (above) and is forecast to become at least a storm while heading toward the south end of Baja (below). Dora has the potential to be the feature that triggers the first significant GoC moisture surge of the summer. Depends of course on actual track and intensity of the system. But the WRF-GFS, on 5.4 km grid, forecast of PW (valid at 11:00 am on the 28th) - bottom - indicates some potential for a surge by Wednesday morning. Debris cloud providing sunrise color again this morning. Surface chart below is from NCAR at about 07:30 am MST - note higher dewpoints to the east and the strong east-northeast winds, especially over west Texas. Pressure gradient from New Mexico/Texas border over to Tucson is quite strong, with pressure to our east more than 10 mb higher. The morning TWC sounding plot above indicates two old BL residual layers aloft that reach above 500 mb, with generally westerly winds. The 500 mb temperatures are quite cold wrt the forecast high today of 113 F. Thus, there should be some mountain buildups closer to the metro area today. The sounding forecast below is from Atmo's WRF-GFS run at 06 UTC. The sounding exhibits a single, well-mixed BL that yields convective cloud bases around 500 mb, with only about 4-5 g/kg mixing ratio in the sub-cloud layer. The forecast sounding is quite classic for dry microbursts, if light showers develop over the mountains. 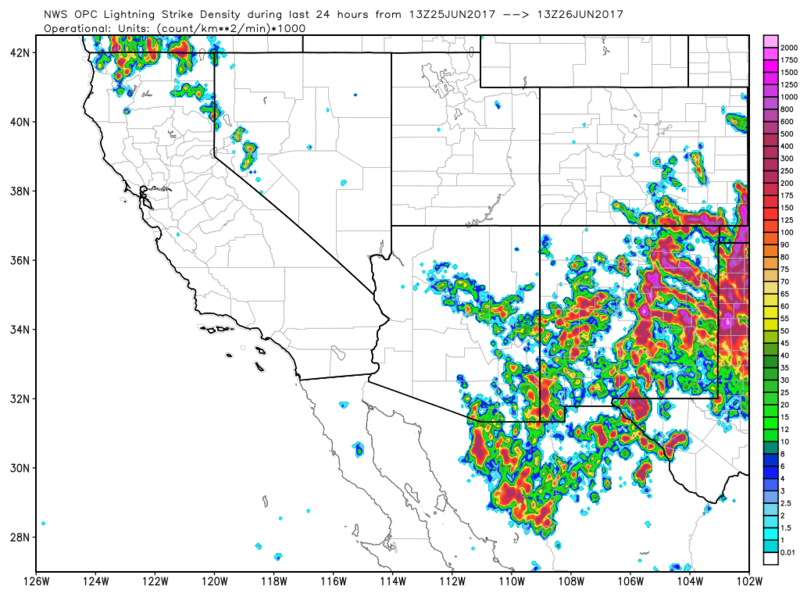 The model continues to forecast widespread thunderstorms over southwestern New Mexico this evening - composite radar echoes above are valid at 07:00 pm. The PW forecast below, valid at 10:00 pm, indicates outflows bringing considerably higher PW into southeast Arizona, so that tomorrow could be an interesting storm day. Shown above is the skewT plot for TWC's 00 UTC sounding data yesterday (see previous post re evolution of BL yesterday). The WRF-GFS forecast sounding was much better than my subjective forecast that the elevated residual BL and SFC BL would merge into single BL. Model forecast was quite good, except for being a bit too moist in surface-based BL. High "only" reached 109 F yesterday. Neither the old elevated or the surface-based BL had any CAPE by 00 UTC. Nice sunrise this morning - when I returned from morning walk at 06:00 am, temperature here at house was 83 F, nearly same as airport's 84 F - yuck. When this front "back-doors" across southern New Mexico, issues will be: how far west will it make it? and how widespread will be the thunderstorms it triggers? Models this morning suggest fairly widespread storms in southwest New Mexico tomorrow afternoon, that push moist outflow westward into southeastern Arizona, making a chance for storms in our area by Sunday. Extreme heat (115 F yesterday) and more wildfires, with homes lost, around Sonoita dominated the news yesterday. Moisture from the GoC has gradually increased due to the persistent heat low and typical diurnal wind circulations - the WRF forecasts had indicated this several days ago. The 500 anticyclone is centered just off to the northeast and it looks to be another grim day for southeast Arizona and much of the Southwest. Had a power surge here - probably as demand increased rapidly as people got up to 90 F temps - and have just gotten PC back to life. Will take a quick look at soundings this morning. The 12 UTC skewT for the TWC upper-air sounding is shown above. The increase in moisture shows up below 750 mb - also in T trace. Residual boundary layers (BLs) seem to reach well above 500 mb. When I estimate the afternoon BL, I see just a tiny bit of CAPE over low elevations. Below is forecast TWC sounding from Atmo's 12 UTC WRF GFS forecast run valid at 04:00 pm MST this afternoon. The model forecasts a surface-based BL to reach only to about 700 mb with well-mixed moisture at 8 g/kg. That is overlain by a hotter, drier, elevated BL - apparently from higher elevations to our north, as per the winds in that layer - that significantly caps the surface BL. The questions is whether or not the two BL structure can actually persist today. I think that a well-mixed surface layer with 8 g/kg is probably quite unlikely - something closer to 6 seeming more likely. Thus, the afternoon atmosphere may be one in which the two BLs of the forecast have merged into a single, deep BL that reaches to around 500 mb. 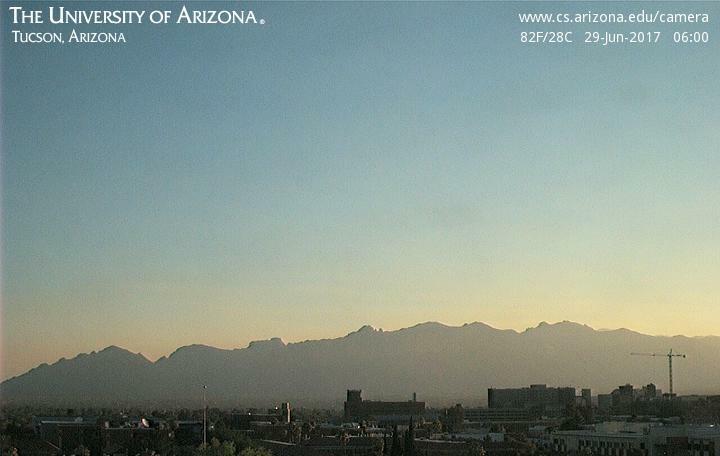 This would lead to build ups around highest mountains and more evening cloud debris over the deserts.